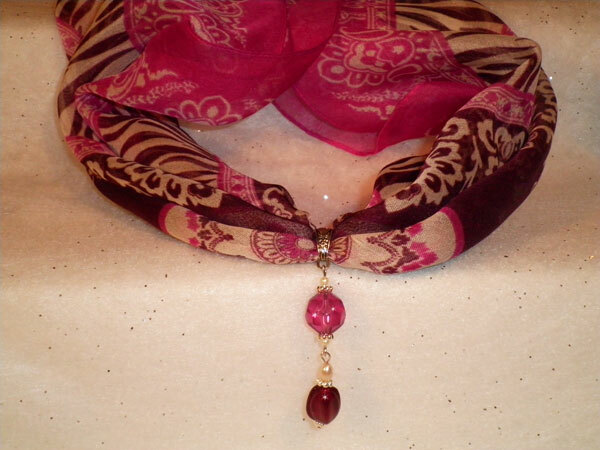 The scarf has an attractive combination of colors with dark burgundy, rose and ivory. The dangle hangs just over 2 1/4 inches and begins with a fully-faceted acrylic round in a rose color surrounded by silver spacers and tiny ivory pearl beads. The lower section starts with an oval shaped ivory pearl, followed by a dark burgandy glass bead and another tiny ivory pearl bead. The glass bead has silver spacers surrounding it. I've included over 30" of burgundy ribbon that can be used to wear the dangle as a separate, coordinating piece from the scarf.